Designed for the SubCultures: Art of the Action Figure exhibit, this fully articulated action figure represents the doubt that alpha male action heroes must have when they lay in bed at night. 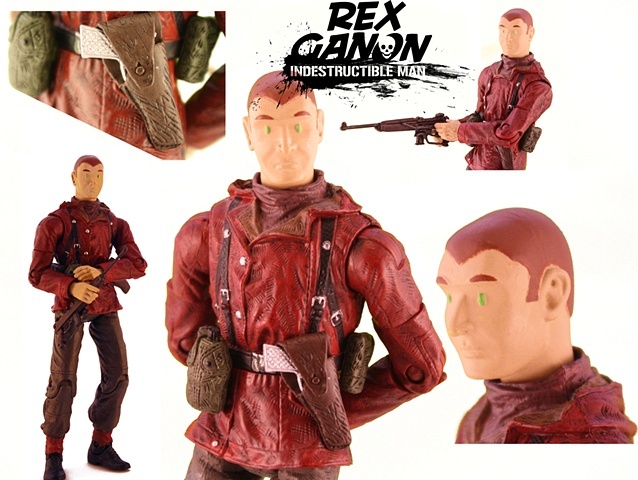 The character, Rex Ganon, has been dubbed THE INDESTRUCTIBLE MAN despite the fact he's a normal soldier who just happens to survive extreme missions. All this pressure is stressing him out. You'll also note the simplistic sculpting offers a loving homage to Herge and Eric So. This figure is available in limited quantities. Each order will be signed by the artist. Standing 6" inches tall, Rex comes with a canteen, 3 pouches, pistol (with real working holster), folding knife/pouch, and one rifle. All the gear is interchangeable amongst the pegs on the belt.